January here in our snowy valley is always a good time to have a repast to warm up the bones, body and soul. After a hard day’s skiing either on our BCRD cross country trails or down-hilling on Mt. Baldy, a delicious hot soup that is easy to make because most of it will be cooking while you are skiing is very desirable indeed. And by the way, you can also after caramelizing your onions, take half of them out and freeze for future use on pizzas, etc. and so just make half of this recipe for your soup. 6 or more thin slices baguette, toasted in a 400 degree oven until golden and quite dry and more slices for your bread basket—and you could just toast it in your toaster to make things easier. 1/2 cup grated Gruyere, Parmesan, Romano, Swiss or any kind of the MUST cheese you can envision for this dish. Serving idea: This wonderful soup plus a green salad, a basket of more baguette slices and a side board filled with an assortment of good cheeses and dried meats would make a great meal at any time of the day—even one to break the day’s fast. Coat a 4-quart or larger slow cooker with some melted butter. Add the onions, (shallots), garlic, oil and melted butter. Toss well, and then season with a bit of salt and pepper. Cover and cook on low for about 5 hours, until the onions are richly colored and sweet. After the first hour toss the onions and you can do this one another time in about 3 hours if you wish. I also place a paper towel under the lid to absorb the extra moisture. Once the onions are ready, sprinkle them with the flour and stir until well-combined. Then add the sherry and vermouth or white wine. Then add the bouillons & water (which should be well heated in the micro) and the herbs; cover and cook for another 4 hours on low or 2 hours on high. Optional: Once the soup is done, stir in the lemon juice and adjust the seasoning. Optional but very good: Beat the egg yolks in a small bowl and whisk in one ladle full of hot soup and then whisk in another ladle full in that bowl. Then add this concoction to the soup. 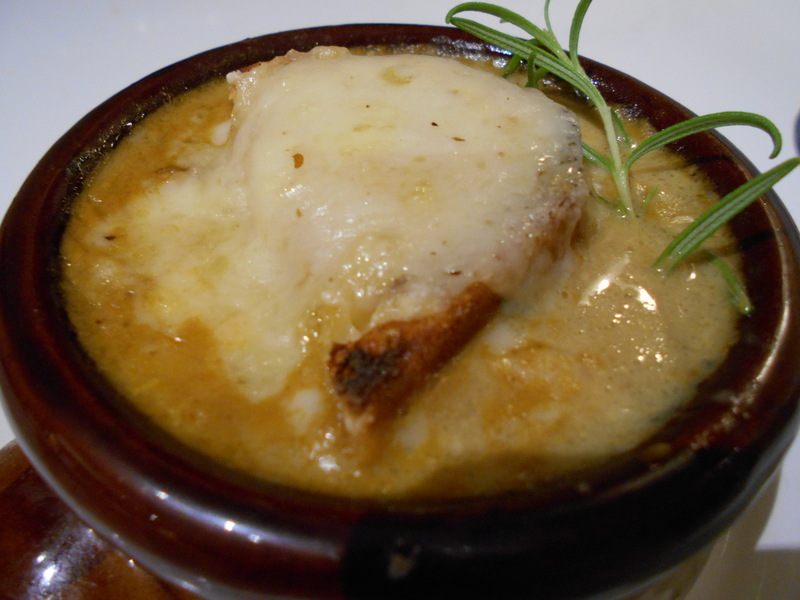 Hints: If you wish, you can place the toasted baguette on the bottom of the crock, ladle in the soup and then top with your choice of cheese; then place it under the broiler for a moment or two. Or you can just add croutons to the top of the soup, plus the cheese and broil it. Or leave out the bread and just top with cheese however no matter what you choose broiled cheese on top is a must. Decisions, decisions, decisions—and don’t forget to remove your herb sprigs before serving. Place the filled crocks on a rimmed baking sheet lined with a bit of foil for easy cleaning and broil just until cheese is golden, 1 to 2 minutes. Do not leave the crocks under the broiler unattended as they will burn quickly so watch carefully. Serve with more toasted baguette slices or even just oven warm slices, a side board of assorted cheeses, dried meats and a green salad and of course, a cupo of vino or yes, even a good glass of bierre. Voila—magnifique!!!! Don’t forget to check in on Margot’s blog: http://blog.tempinnkeeper.com for more than 200 recipes.